Born in Yokohama in 1943. As a leading Japanese designer, Uchida has engaged in diverse design projects worldwide from architectural interior, furniture and industrial design to urban planning. His major works are series of boutiques for Yohji Yamamoto, the Hotel Il Palazzo in Fukuoka, the Kobe Fashion Museum, the tea rooms “Ji-an, So-an, Gyo-an,” the Mojiko Hotel, AVIAMO series for Fujitsu General, and Oriental Hotel Hiroshima. His works are held in permanent collections at the Metropolitan Museum of Art, the San Francisco Museum of Modern Art, the Conran Foundation and others. 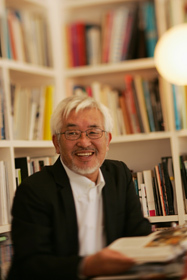 His publications include ‘Mojiko Hotel Aldo Rossi Shigeru Uchida,’ ‘Japanese Interior Design-Its Cultural Origin’, ‘Furniture Book’, and ‘Shigeru Uchida with Ikuyo Mitsuhashi’. He is a recipient of numerous prestigious awards including the Mainichi Design Award and Education Minister’s Art Encouragement Award. In 2007, he was honored with Medal of Purple Ribbon.